Leveling up quickly in FFXIV is harder than you thought? We’ve all been there – looking for ways on how to level up faster. 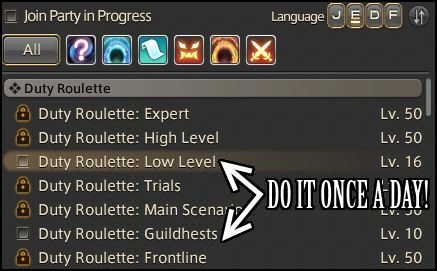 Well in this general leveling guide I’ll be listing all ways I know of to make life to max level a little less painful. Just to clarify, this guide is for any combat class. And mostly does not apply to gathering or crafting classes. If you’re a new player, or an old-timer leveling an alt – it’s good to read this to remind yourself on what to do (and maybe learn something new). Are you Leveling up a: Gladiator, Marauder, Conjurer, Thaumaturge, Arcanist, Archer, Pugilist, Rogue,Lancer. Is this your first Character? If yes – then the ultimate advice would be to FOLLOW YOUR STORY QUEST. Don’t stress out too much about random side quests. Keep following your story quest until you do not reach the level requirement, then read more below on how to gain EXP. Side Quests: give the most bang for you buck in terms of time/exp, next to story quests. They’re also present anywhere you’re doing story quest. So pick them up. Do not linger in a zone to complete side quests. Once your story takes you elsewhere, go. However, these above two points only apply to your “first” characters… for the rest of us, the below tips serves as a good reminder what to do when you need to gain levels. Ran out of level appropriate sidequests & story quests? Read below. This thing is chunky. Maximizing your challenge log is mega value EXP at any level. This is first unlocked at level 16 (15? ), and can be abused by any level character thereafter. Completing any entry in the challenge log reaps you some sweet EXP and or Gil. New player? How do I unlock Challenge Log? Players can unlock the Challenge Log by completing the level 15 Rising To The Challenge. (Location/NPC: I’tolwann, Limsa Lominsa Upper Decks (x11,y10)). complete FATE in 5 different zones. All of the above give BONUS exp upon completion. It resets every week so you don’t have to rush! You gain bonus EXP depending on your current level, so the higher the better. Hunting Logs. Basically a list of enemies to kill for large bonus EXP. I would suggest completing these each time you reach levels ending in 5 (5,15,25 etc…). Monsters can be difficult if you rush these, (IE trying to complete your level 20 log once you hit 20 or 21). Aside from dungeons, doing this triggers rested EXP so it gives quite a boost. Don’t skip Hunting Logs! ALWAYS complete it before entering the next tier (20,30,40 etc). For example, before you hit 40, make sure your tier 3 hunting log is done with. You’ll regret it – trust me. Starting at level 10, and every 5 levels thereafter, you get to do 2 new Guildhests. These give chunky as hell EXP, and is worth every second you spend queueing. Again for the sake of Challenge Logs, Guildhests contribute to quite a few: 3x Guildhests, 10x Guildhest, and indirectly 5x Player Commendations Given. If you need to spam Guildhests, “Under the Armor” seems to be the de-facto spamming hest for the population at large. Daily Roulette: Guildhest gives you 5-10% of your EXP bar.. so theres no reason not to do these. Surprisingly a lot of people don’t know that the ‘first time completion bonus’ applies to each new class you do it with! Fategrinding + Levequests spamming in Aleport: Hands down this is the way. Dungeons are a massive source of EXP. The only bad thing about these are the queues. So if you’re DPS, you might want to look at other activities while waiting. Duty Roulette: Low level almost GUARANTEES a level up. You also tick up one on the Challenge Log for dungeons completed via Roulette. This is THE goldmine for EXP and if you just did this once a day you’ll max out every class in no time. (This is first unlocked at level 16). This is where your rested EXP gets chunked (good thing), and always remember to eat food prior to each dungeon. The 3% bonus EXP is always welcome. There are 2 entries which relate to dungeons in the Challenge Log: 3x Dungeons via Duty Roulette, 5x Dungeons completed.WHile the bonus EXP isn’t huge – if you do Low level roulette for 5 days you’ll nail both. And you’ll probably have 5 more levels to show for it! These are by no means set in stone. Going earlier means better gains in EXP due to chains. However, being underleveled means you cannot solo these fates – so you’re going to need a party. Start one! Or put up a Party Finder! Getting maximum contribution in fates while in a party is much easier and faster compared to solo. The only downside is you cannot queue while in party. Again, for the value moves, FATEs have 2 Challenge Log entries tied to them: 10x Unique FATES, FATE completed in 5 maps. These are quite easy to fulfill and you don’t even have to go out of your way much for them. While not the fastest method, it fills out the gaps and gives the feeling of changing things up. Thankfully there are two Challenge Log entries related to Leves: 4x unique Levequest types, 20x Levequests completed. Not all levequests are equal: keep in mind that you do not need to kill all enemies – you must simply complete the levequest objective. This leads to some leves taking too long for good value. Keep this in mind when spamming – leave out the sucky leves. protip: 4x Unique Levequest types (Challenge log) can easily be completed by doing regular battlecraft leves and GC leves in any given town which offer them. protip: 20x Levequests (Challendge log) : if you’re lazy, you can spam 19 low level crafting leves that you can buy from NPC’s, then complete the 20th one with your combat class. The Challenge Log EXP bonus is granted FULLY to the active class, regardless how you spread out the leves. 3% EXP from food buff: It may not sound like much but it’s a welcome bonus. You can buy any cheap food from NPC’s (Boiled Egg comes to mind). Chocobo: While not super effective, having the trusty bird around will make life a bit easier. Heat of Battle: Free Company boost “Heat of Battle” gives bonus exp % to enemy kills. Awesome for dungeons. Accuracy problems: This hampers your leveling process more than you think! If you happen to come across gear with accuracy, keep it. Or craft/meld them yourself! Also, cheap accuracy food goes a LONG WAY. Buy cheap ffxiv power leveling from us now. If you need some cheap ffxiv gil, Cheapowerleveling.com is a good choice.